Combine mince, stock powder and steak seasoning in a large bowl. Mix well. Roll tablespoons mince into balls. Place couscous in a large, heatproof bowl. Cover with boiling water. Cover bowl and stand for 3 to 4 minutes or until liquid is absorbed. Stir with a fork to seperate grains. Heat a large, non-stick frying pan over medium heat. Spray meatballs with oil. Cook, turning often, for 10 to 15 minutes or until browned and cooked through. Meanwhile, add chickpeas, mint, parsley, lemon rind, 2 tablespoons lemon juice, onion, raisins and tomatoes to couscous. Stir to combine. Season with salt and pepper. Spoon couscous salad into bowls. 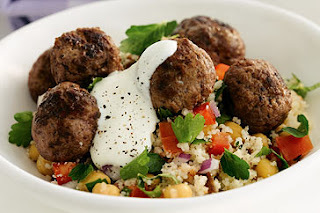 Top with meatballs and 1 tablespoon yoghurt. Season with pepper. Serve.